This post is a bit like cheating. I’m telling you about the book so I can share a recipe for muffins, which I feed to my non-foodie baby. I posted a photo of them to Instagram yesterday and someone asked for the recipe, so, since the recipe is for something I feed Toddler, why not also write about a book I read to Toddler as well? 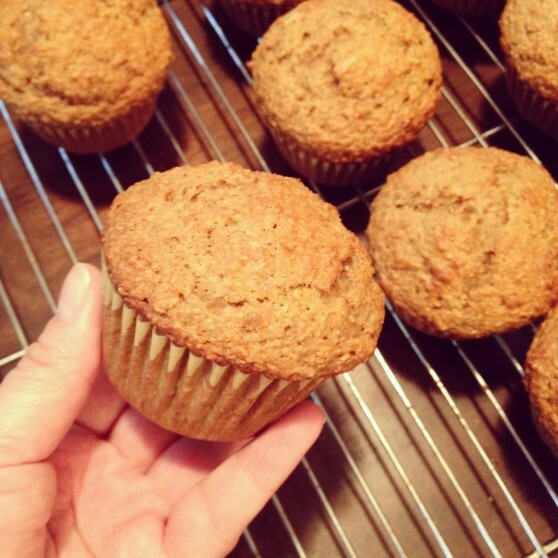 It’s a bit of a stretch, sure, but these are pretty good muffins. My copy of Foodie Babies Wear Bibs was a gift at a baby shower thrown by my colleagues at my old job at the university. At the time, I was expecting to spend much of my maternity leave introducing exciting flavours to a little boy who would surely be thrilled by each and every one. I ended up with a toddler who is not even interested in flavours except the flavours that store-bought pudding comes in, and to be honest I’m not even sure where he discovered store-bought pudding, so my expectations have shifted somewhat. When I got my wisdom teeth out last week, Nick bought me a whole bunch of pudding; what’s left over has been tempting Toddler since. As I mentioned in another post, he will eat a muffin. 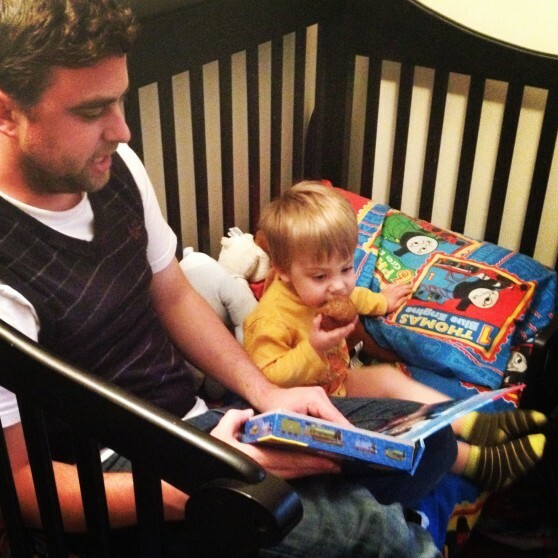 He actually really likes Foodie Babies Wear Bibs, and will enthusiastically pretend-eat any and all food, insects or animals off the pages of his books. 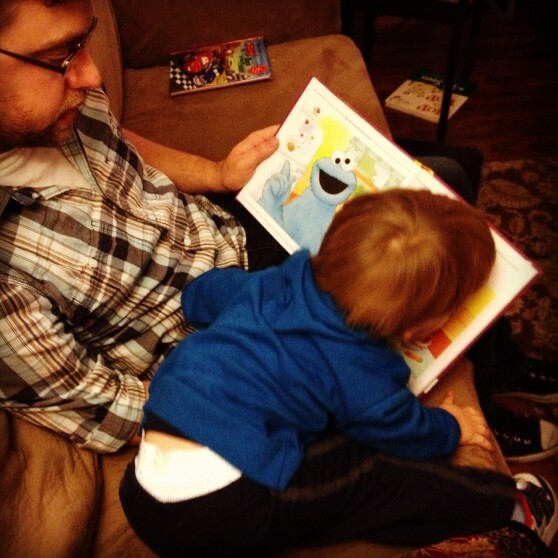 He has a Cookie Monster book where Cookie Monster makes and serves a turkey dinner – Toddler pretend-gobbles it right up! Real turkey is, of course, an insult. I guess liking (and eating?) books counts for something, so I shouldn’t complain. So, muffins. I made a dozen yesterday and only have five left, so they must be pretty good (though I’ll admit I did break my own no-white-flour-rule). These are made with pear sauce, as I made and canned a ton of it last September, but you could make these with applesauce and they’d be just fine. I also used maple extract to boost the mapley taste, but if you don’t have that, vanilla will do fine. 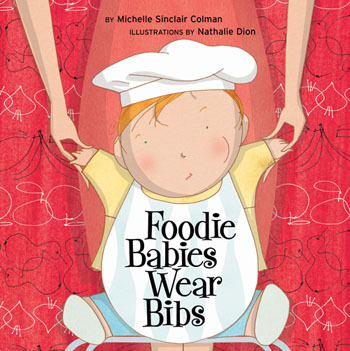 And if you need a baby shower gift, pick up a copy of Foodie Babies Wear Bibs; just warn the mum-to-be to never speak her desire for a well-rounded eater out loud because she’ll jinx it. Preheat your oven to 400°F. Grease your muffin tins, or use paper liners which I prefer since my muffin pan is on its last legs. If you can find them on sale, the parchment liners are great and peel off easily. Combine your wheat bran, flours, flax, baking soda, and salt in a large bowl. Whisk together. Set aside. In another large bowl, whisk together pear or applesauce, eggs, sugar, and maple syrup. Add butter and maple or vanilla extract, and whisk again. Stir your dry ingredients into your wet ingredients until your dry ingredients are just moistened. Spoon your batter equally into your 12 muffin cups. Don’t level the batter off it appears uneven; the muffins will sort themselves out in the oven. Bake for 8 to 10 minutes, then open the oven, turn the pan around, close the oven door, and bake for another 8 to 10 minutes, or until a toothpick inserted in the centre comes out clean. 16 minutes was perfect for my oven. When the muffins are ready, remove them from the pan onto a wire rack and let them cool. Once fully cooled, you can freeze these in a container with a tight-fitting lid for about a month; they’ll store in a container on the counter for a week otherwise. Eat them buttered, with a good book. Pants optional.